I am ready for Spring. Seriously ready. I am ready for warm weather, rain showers, and packing up the winter clothes. With that in mind, I decided to treat myself to an early taste of Spring a few nights ago. 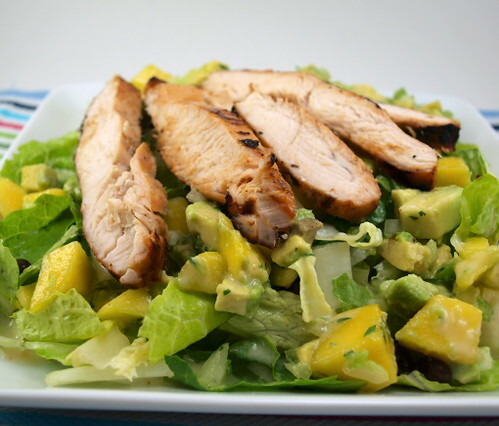 It was cold outside and I was feeling a little blue, but this salad perked me right up! Just looking at it, with its cool greens and bright yellows, made me feel that I could hold out a few more weeks. What I like best about this salad is the dressing. 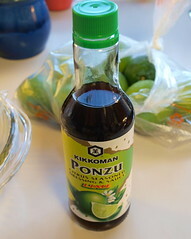 It is cool, light, tangy, and refreshing. 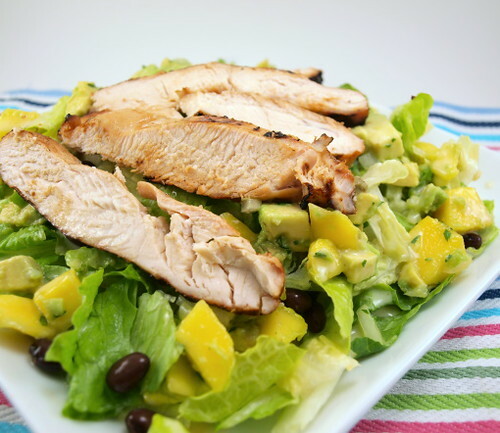 It has enough flavor to hold its own against the avocado and mango, but is not overpowering so that all you taste is dressing. 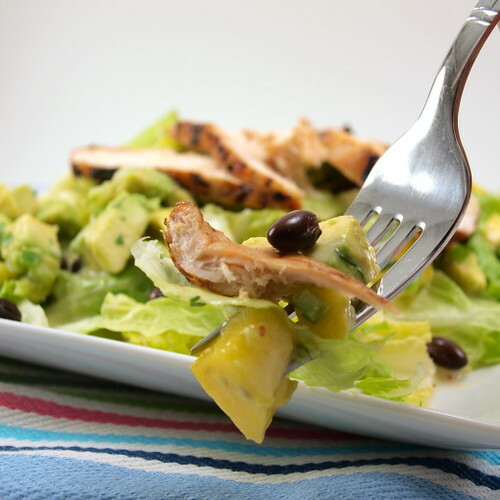 The light sweetness from the honey is the perfect contrast to the savoury grilled chicken. 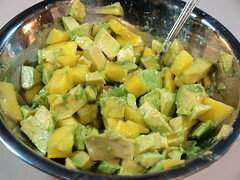 If you are ready for Spring, like me, give this salad a whirl! 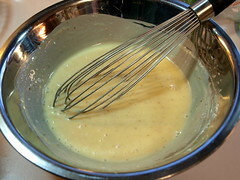 In a medium bowl whisk together all the ingredients for the salad dressing. Cover and chill for at least an hour. 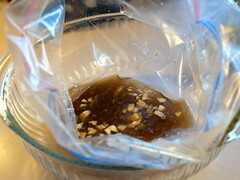 In a plastic bag combine the ponzu, lime juice, garlic, and sugar. Add the chicken and allow to marinate at room temperature for thirty minutes. 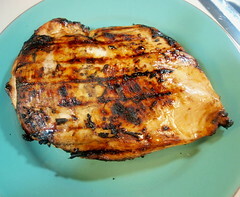 Once marinated, grill or broil the chicken until it reaches an internal temperature of 160 F. Cover with foil and allow to rest for ten minutes before slicing into 1/4″ strips. 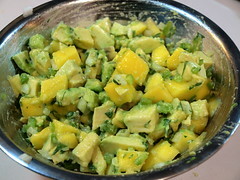 In a medium bowl combine the avocado, mango, onion, jalapeno, and cilantro. Mix well. 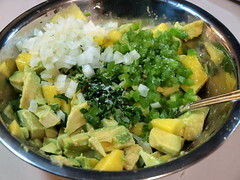 To serve place the lettuce on a place, then top with black beans and the avocado mango mixture. 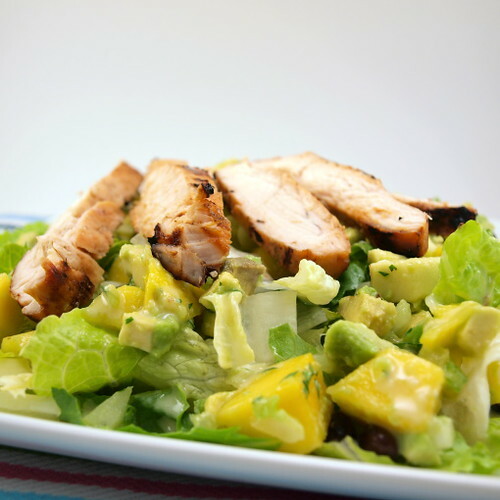 Drizzle with dressing then top with some slice chicken.